There have been many imitators, but there is only one duo in North America sanctioned by Dan Aykroyd and Judith Belushi to don the official hat and sunglasses and walk in the legendary footsteps of Jake and Elwood Blues. Under the musical direction of Paul Schaffer, The Official Blues Brothers Revue pays homage to Chicago’s rich history of blues, soul music and gospel in the true spirit of the original Blues Brothers. 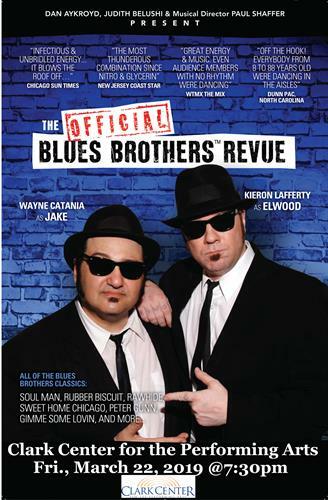 With Wayne Catania as Jake, Keiron Laffery as Elwood, and backed by a powerhouse band, The Official Blues Brother Revue lays down a big sound performed with passion, precision, and pure soul. They strike the right balance of humor, music, and mayhem in a show that is fun for all ages and packed with classic hits from the Blues Brothers catalog, including “Soul Man”, “Sweet Home Chicago”, Rubber Biscuit” , and more.